Following on from Thursday’s post I am sharing another article from Woman and Beauty today. 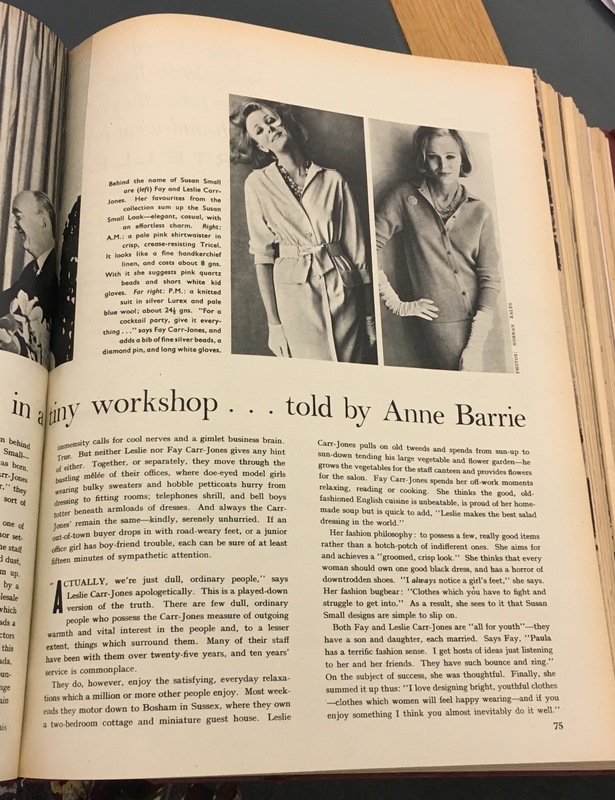 This article was actually the first in the 1961 series Window on Fashion and traces another well known ready to wear firm, Susan Small. I have transcribed the article in full below. Sorry for the slightly rubbish pics of the original article, the magazines were all in a large bound volume, so it was difficult to get pics of the pages properly. There is little indication in this peaceful, homely scene that these two people, Leslie and Fay Carr-Jones, mean more to millions of women in Britain and abroad than the latest pop singer or the most vigorous cabinet minister. But, as founders, promoters, directors and guiding stars of Susan Small Ltd., wholesale couturiers, they are responsible for dressing well over three hundred thousand women each year. And that is not all. Today, the twin words, Susan Small, have come to evoke a special vision- of intense, bewitching femininity: of great, but casual, elegance. From that moment on, the Susan Small saga is one of zooming success and bounding growth with only minor set backs. Such as the time during the war when most of the staff left to work in munitions factories and machines gathered dust, starved of fabrics and skilled hands which could make them up. Now the small, dark workroom has been replaced by a humming stack of offices in the heart of London’s wholesale fashionland, just North of Oxford Street. The designs which flood from the drawing boards- Fay Carr-Jones now heads a team of three designers- keep over a hundred sub-contractors at work for weeks at a time. The end result of all this industry? Any woman, from size 8 to 20, in France, Canada, the Bahamas, the British Isles and thirty five other countries can walk into her nearest main store- and, in exchange for between five and twenty-five guineas, walk out again wearing a Susan Small garment. One might imagine that controlling an organisation of this immensity calls for cool nerves and a gimlet business brain. True. But neither Leslie nor Fay Carr-Jones give any hint of either. Together, or separately , they move through the bustling melee of their offices, where doe-eyed model girls wearing bulky sweaters and hobble petticoats hurry from dressing to fitting rooms; telephone shrill, bell boys totted beneath armloads of dresses. And always the Carr-Jones’ remain the same- kindly, serenely unhurried. If an out-of-town buyer drops in with road-weary feet, or a junior office girl has boy-friend trouble, each can be sure of at least fifteen minutes of sympathetic attention. “Actually, we’re just dull, ordinary people,” says Leslie Carr-Jones apologetically. This is a played down version of the truth. There are few dull, ordinary people who possesses the Carr-Joes measure of outgoing warmth and vital interest in the people and, to a lesser extent, things which surround them. Many of their staff have been with them for over twenty-five years, and ten years’ service is commonplace. Her fashion philosophy: to possess a few, really good items rather than a hotch potch of indifferent ones. She aims and achieves a “groomed, crisp look.” She thinks that every woman should own one good black dress, and has a horror of downtrodden shoes. “I always notice a girl’s feet.” She says. Her fashion bugbear: “Clothes which you have to fight and struggle to get into.” As a result, she sees to it that Susan Small designs are simple to slip on.